The Nightmare on Elm Street films, whether frightfully good or laughably bad, are seminal entries in any young horror fan’s viewing repertoire. Although nary an 80s American horror film can compete with Wes Craven’s brilliant original, many of that film’s box office-reigning sequels fall into the category of weak imitation or ill-advised parody. In my opinion, the best Nightmare sequels bring some fresh meat to the cinematic table. Although Wes Craven’s spiral-plotted, self-referential gem New Nightmare — though not technically a sequel — takes the award for most interesting and well-crafted entry in the Nightmare franchise, A Nightmare on Elm Street 5: The Dream Child does an admirable job of flexing its own brand of creative claws. Because of its engaging ideas and original plot, it’s the best of the straightforward Nightmare sequels. 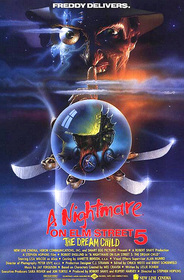 Taking place shortly after the events of A Nightmare on Elm Street 4 — surely the most bland and mainstream entry in the Nightmare franchise — Nightmare on Elm Street 5 continues the misadventures of introvert final girl Alice as she is faced with high school graduation, a long-term relationship, an illegitimate pregnancy, and — of course — Mr. Freddy Krueger. Krueger finds a new and absolutely twisted way to get into Alice’s head: the persistent dream state of her unborn child. This detail allows Krueger to taunt Alice even when she’s awake. A morbid plot, to be sure, but a great, creative idea that truly adds a bit of spice to the repetitive Krueger sequels. As the plot unrolls at lightening-fast speed, even the Nightmare mythology gets a much-needed kick in the pants as we are treated to more information regarding the origins of Freddy’s evil persona. Seeing as this is a Nightmare film, it doesn't take long before Freddy invents cruel and visually spectacular methods to dispatch of Alice’s comrades. There’s a dynamic motorcycle chase that leads to Giger-esque homicide, a gory bourgeois feast, and a stellar romp through a live-action comic book. To go along with the rather morbid killings, Freddy’s one-liners contain a lot less comedy this go-round. It’s a much more suitable Krueger than we’ve seen in the last two Nightmare entries. The effects and makeup—a trademark of even the lamest Nightmare sequels—are first class in A Nightmare on Elm Street 5. Freddy’s burns are deep and wet, and lack the rubbery feel of the mask/makeup in Part 4. And the deaths truly represent the best physical makeup money can buy. Some brief, cheesy stop-motion work lowers the overall impression of the effects, but in the day and age before CGI dominated even the smallest of fright films, the classic gore effects of The Dream Child are more than suitable. Even though the film strikes a positive chord for the overall Nightmare franchise, it certainly isn’t without its flaws. For instance, Krueger’s return is left completely unexplained. There is a scene where he is “reborn” into the dream world, but hats off to anyone who can make heads or tails of what the hell happens to resurrect him. Also, Alice’s visions of a disturbed little boy named Jacob are over-the-top and strike the wrong note. Overt, boring melodrama and heavy-handed metaphor don’t mix well with the carnage of the fourth sequel in a dated series. The acting is as wooden as ever. Lisa Wilcox’s Alice seems to have found a completely new set of “best” friends in record time, and her performance has little of the naivety that made her such a welcome addition in Part 4. The character’s name could easily have been changed if Wilcox hadn’t agreed to do the sequel and the film would still work the same. In short, Alice lacks personality this time around. The supporting actors can’t compete with the fleshed-out insomniacs of Part 3, but have a leg up on the lame friends from Part 4. Though slightly illogical and not as campy as its predecessor, Nightmare 5 isn’t nearly as bad as you would think. By the 5th film of the Friday the 13th franchise, Jason fans had nothing this good, so Freddy fiends should be grateful that the series has held up as well as it has in comparison. Those disenchanted with earlier sequels may even find a newfound interest in the Nightmare franchise after Part 5. 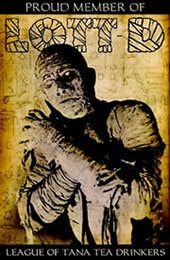 Far from perfect, it’s a gory, demented romp that adds some much needed originality to the Nightmare mythos. The other sequels took the easy way out. This one tries something new, and that’s something to be commended. Submitted by iheartslashers on Sat, 2011-01-01 19:42. He came back both because he wanted to come back and because he wasn't dead yet. Submitted by Ray Crowe (not verified) on Mon, 2011-09-19 07:40. It's nice to see someone else who actually likes this one. Most fans hate it, but I think it's just as entertaining and stylish as Part 4. Freddy was no longer all that scary by this point, so Part 5 plays with the concept a bit and pokes a little fun without going overboard, and there is a queasy creepiness to the elaborate death scenes. It also brings back Alice from Part 4, which is good.